Islands are place of constant ebb and flow. The tide moves back and forth across the sandy beaches, turning rocks and pebbles over in its gentle hands, or thrashing them against the shore when the sea breeze whirls into a storm. There is a flux of people, in and out: tourists and locals, the welcome and the unwelcome. Every islander is a part of this thrumming hive – part of this constant flow, through time and space. So how do you create art that embraces and reflects this constant change? That is the challenge that Andy Goldsworthy took on in Alderney. 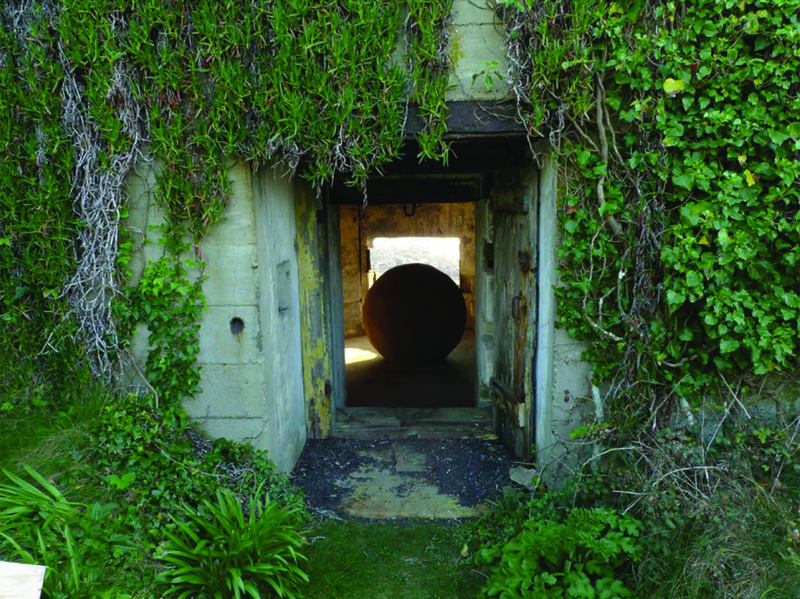 After spending much time in Alderney and the surrounding Channel Islands, Goldsworthy came up with a multi-piece artwork that would react and change in space and time in much the same way the island itself does. The installation is comprised of a series of rammed-earth boulders that each have items from the island compacted inside them. The stones are installed in different locations across Alderney, and this in itself is an important part of the life of the piece. The stones were designed to gradually disintegrate over time, releasing their contents, and the location of the stone affects the speed at which this occurs. You can see from the way the stones sit in their respective locations that they have really found their place, and perhaps also that the place has found them. When Andy Goldsworthy talks about the piece, this ‘from the island, for the island’ ethos is clear. “I didn’t want to do something pretty” he said; “Alderney is beautiful, but not pretty. As an artist I have to respond to what I find”. The movements of islands are infectious, and while Andy Goldsworthy has certainly had an impact on the landscape of Alderney, it is clear that he took something away with him as well. Click on any of the thumbnails below to view the full-size gallery. Most of the photographs in this gallery were taken by Rachel C Kremer. For more information and photos of the Alderney Stones (including all image credits) please visit: www.alderneystones.com. Natalie North lives in Guernsey and works for the Art and Islands Foundation, which brings international artists to the Channel Islands and promotes them as a cultural art destination. Natalie's blog can be found here. Rachel C Kremer is a UK-based photographer with a love of film cameras, folk music and island-hopping. Her website can be found here. Bringing together great writing and visual art from islands all over the world, we provide a second home for island lovers everywhere. The Island Review relies on the generosity of its readers to help with running costs. Please consider making a donation. A small contribution from you can make a really big difference to us. Thank you. A confirmation will be in your inbox shortly.